Tag Archive | "Procter and Gamble"
One of the most moving commercial’s that came out last year was Procter & Gamble’s 2012 Olympic Games commercial honoring mothers for everything they do. “Best Job,” the gripping two-minute film, the centerpiece of P&G’s “Thank you, Mom” campaign, interweaves the early life stories of four aspiring Olympians growing up concurrently in four different corners of the globe. This article on ESPN briefly covers what went into the making of this brilliant commercial. “A mother’s job is the hardest in the world, but it is also the best in the world. The universal thread that runs through each of the 4 narratives in this ad is the omnipresent nurturing mother who cooks, launders, shepherds, chauffeurs, ankle-wraps, exhorts, comforts and — as the music crescendos — celebrates her child’s Olympic triumph through tears of joy and pride. It’s a compelling piece of filmmaking and one with the power to render even the most stoic of us a little misty, as if we were watching our own daughter nail the most important beam routine of her life. 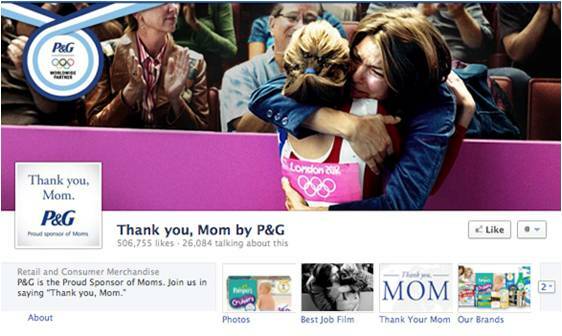 Once the connection of P&G supporting moms & the Olympics was established by the advertising agency (Wieden + Kennedy), the creative team developed the concept, which was to tell the stories of four athletes simultaneously, from morning until night and from early childhood until athletic prime. The choice of protagonists — a female gymnast in Los Angeles, a male sprinter in London, a male volleyball player in Rio de Janeiro and a female swimmer in Beijing — reflected the team’s desire to imbue the spot with a relevant Olympic feel, to resonate with mothers from different cultures and to showcase “cinematically interesting” locales. The way someone raises her child in Los Angeles looks a lot different, on the surface, than how someone might do it in Beijing. But even though these moms all around the world are so different, they actually have much in common. This commercial was created to celebrate those commonalities. While all four athletes’ journeys culminate in Olympic victory, the journeys themselves look very different. The mother of the Chinese swimmer waves goodbye to her daughter, who is ostensibly departing for a centralized training center, and years later watches her Olympic victory on television from afar. The mother of the American gymnast, by contrast, is with her daughter at every turn and tumble, and has a front-row seat in the Olympic arena.There is a universality and an emotion to all of these stories, which make it such a moving and powerful piece. The ad has been heralded on social media by athletes (like beach volleyball player Kerri Walsh and swimmer Ryan Lochte) and their mothers (like Gail Sacramone, mother of Olympic gymnast Alicia). But the spot also moves the mere mortals among us who, even if we never played sports at a high level, recognize a familiar love and sacrifice in the mothers we see on screen. Share With Your Classmates and Friends Now! Copyright © BMMBox.com. Theme by Woo Themes.